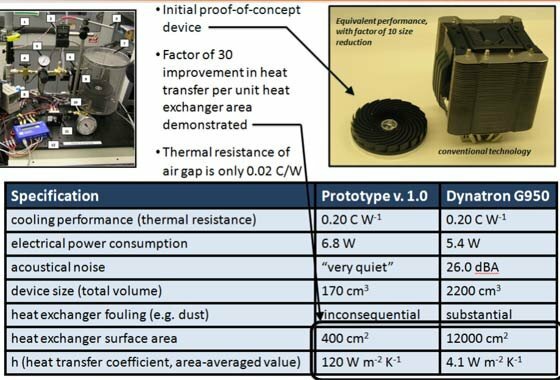 Sandia Corporation, a wholly owned subsidiary of Lockheed Martin, introduces a proof-of-concept cooler that promises almost 30 times higher heat transfer efficiency than traditional tower heatsinks. The Sandia cooler uses a different approach to cooling, the cooler doesn't directly touch the thing it is intended to cool but spins above it at a mere 1/1000th of an inch on an "air bearing". The cooler promises very quiet operation and according to Sandia it can be manufactured at a cost of less than $10. A LED cooling firm has already signed a license and Sandia is in talks with four chip cooling companies to discuss business partnerships.